Modified thinboiling starches like acid-modified, oxidized and ethylated are used in the textile industry. Yarn. The yarn can be woven or knitted. The warp will be in the loom for a long time and needs to be strong. Filling yarns (weft) are inserted by the shuttle on the loom to weave the fabric. The filling yarns do no require the same strength. Creel. For each yarn in the warp an end-cone is loaded on the creel and the yarn is pulled of the cone during weaving. The yarn is tied to the yarn already in the creel. The yarns are tied onto the beam and the winder is set to wind the desired amount of warp. The yarn is wrapped round the warpbeam and the beam is loaded onto the shlasher. Slasher The wound beams are loaded into the frame for the slasher. The job of the slasher is to coat the warp yarns with sizing to give them added strength to withstand the punishment of weaving.When all the beams are loaded, the yarn is tied to the yarn already in the slasher. The starch for the sizing is cooked.The warp is mechanically pulled through the sizing, dried, and wound onto a big metal beam that will go into the loom. The starch is applied very hot. The starch keeps the yarn straight and strong and makes it stand the stress of weaving. The yarn is feed through the heddles and the loom is about to be ready for weaving. Desizing.Cloth as it comes from the loom has to be treated in a series of processes known as finishing operations. There are removal of impurities - includes desizing - and application of various chemicals, dyes, softeners, etc. Size is a mixture of substances that is applied to the warp thread before weaving. The size forms a coating around the surface of the thread before weaving. 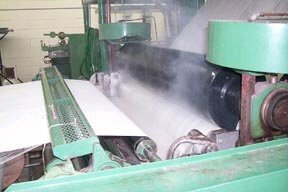 This coating provides the lubrication and prevents the breakage of warp thread during the weaving operation. Desizing removes the size after weaving. A starch size is removed by enzymatic desizing with amylase. In general cellulosic fibres, cotton, rayon and blend of these with synthetic fibres such as polyester, is sized with starch based sizes. Starch has good sizing properties on cellulosics and is economical.